To have a water cooler or not? That is the question. Well, question no more as the answer is a resounding yes! 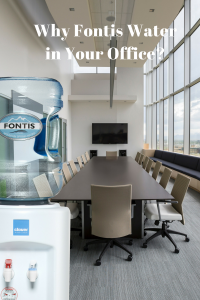 According to business.com, the benefits are endless for placing a water cooler in your office, and in our opinion, even more beneficial when you choose a Fontis office water cooler. More productivity since your employees won’t need to leave the office for a beverage. The potential for a positive workplace culture to develop and grow. Free water is an added perk by employees. And the best news? Water coolers and water filtration systems can all be set up in your office by Fontis Water. Unlike a lot of water delivery service companies that sell filtered tap water, we source our water from our own springs, nestled deep in the Blue Ridge Mountains and protected from agricultural or industrial runoff. Family owned and operated since 2003, Fontis bottles 100% pure spring water and delivers it to homes and businesses in and around Atlanta. Our spring water combined with our customer service is why Fontis Water is the best water delivery company in Atlanta. Our mission is to deliver the best, most preferred natural mountain spring water with unmatched customer service and genuine enthusiasm. It’s been a family tradition since 1980.